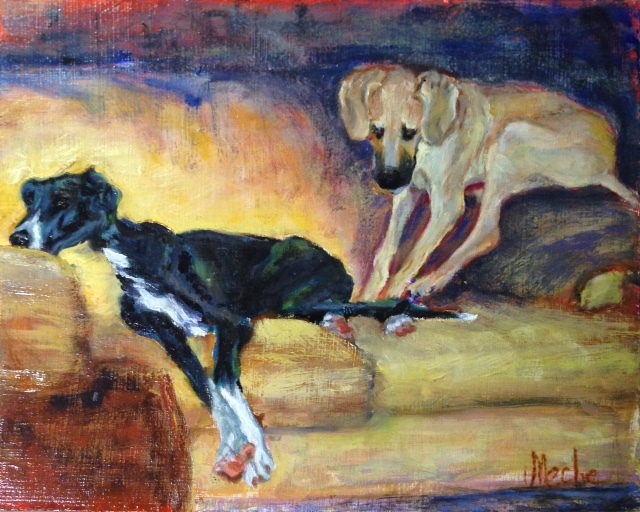 Dogs Oil Painting on Canvass, "Chole & Nala", 9x12, by Mercedes Franklin, Private Collection. Chole, the black & white Great Dane, was about 8 months older than Nala, the fawn color Geat Dane. When they were younger they both fit on this couch. As Chole grew Nala was pushed back to the side 'til she began sleeping with her front paws on the couch & her hind end on the arm rest. No one ever heard her complain.